The University of New Brunswick’s state-of-the-art Andrew and Marjorie McCain Human Performance Lab is enabling researchers and surgeons in Atlantic Canada to develop treatment strategies for children living with cerebral palsy. Dr. Victoria Chester, professor in the faculty of kinesiology, is conducting gait analysis trials with surgeons from the Horizon Health Network and partners at the Stan Cassidy Centre for Rehabilitation. Gait analysis is used to assess, plan and treat patients with conditions affecting their ability to walk. "The gait lab provides a unique 3-dimensional assessment of movement, which is not available anywhere else in the Maritimes," says Nicole Desaulniers, a physiotherapist at the Stan Cassidy Centre. “Rehabilitation treatments, medical and surgical procedures are planned according to reports generated at the lab. It is an incredible opportunity for our patients to have this type of technology so close to home, and ultimately, it improves their chances at better day-to-day mobility and independence. While gait analysis can be conducted on both children and adults, children affiliated with the Stan Cassidy Centre—and especially those with the most severe conditions—are currently given priority. "This is one of the most fulfilling and rewarding aspects of our work," says Chester. "We have the opportunity - thanks to this technology and our partnership with the Stan Cassidy Centre - to help these children move as freely and independently as possible." In practical terms, this might mean empowering a child to improve their walking skills, get in and out of the bathtub, or transfer in and out of a car, by him or herself. UNB's motion capture technology system - the same technology used in movie production - allows researchers to place reflective markers on subjects' skin to analyze their movements. In the case of children living with cerebral palsy or other movement-related conditions, the technology provides surgeons with data on weight-bearing patient movement - something that cannot always be appreciated from clinical tests or visualized in an operating room when a patient is under anesthesia. Chester and her colleague, Dr. Usha Kuruganti, aided in the design and commissioning of the infrastructure and facilities within the world-class Andrew and Marjorie McCain Human Performance Lab facility located in the Richard J. CURRIE CENTER at UNB in Fredericton. The lab houses the world's most advanced 16 megapixel Vicon motion capture system to accurately track and record movement. The high resolution of the cameras enables researchers to study the details of locomotion and mobility impairment, and is used by private companies and researchers across North America as an industrial standard. 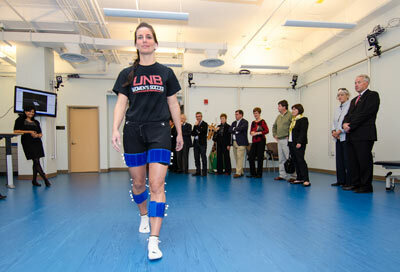 The world-class technology of the human performance lab, as well as the expertise of a multi-disciplinary team of researchers and clinicians in the fields of biomechanics, neuromuscular physiology and chronic disease management, has established UNB as a leader in health and wellness research in the Canada.